The etch pits on the Nakhla sample which the team examined. A newly published study details the test results of a 1.7-gram fragment of a Martian meteorite known as Nakhla, showing the first evidence of water dissolving the surface of Mars. Scientists at the University of Glasgow together with the Scottish Universities Environmental Research Center and the Natural History Museum (London) have discovered the first evidence of water dissolving the surface of Mars. In a paper published in the Meteoritical Society’s journal MAPS, the research team outline the results of tests on a 1.7-gram fragment of a Martian meteorite known as Nakhla, which was provided by the Natural History Museum. Previous research on Nakhla has provided evidence of the existence of water on Mars through the presence in the meteorite of ‘secondary minerals’ – types of carbonates, hydrous silicates and sulfates most likely formed when Martian minerals reacted with liquid water. Professor Martin Lee of the University’s School of Geographical and Earth Sciences, lead author of the paper, said: “What has been unclear in the past is exactly where the chemical elements which made up the secondary minerals within Nakhla came from. “What we’ve found for the first time is evidence that the etch pits were created when water dissolved the olivine and augite, and that the elements released from those minerals led to the formation of the secondary minerals. Professor Lee added: “From the amount of dissolution we observed, it’s likely that this particular piece of Mars was affected by water for only a few months and probably less than a year in total. “That’s certainly not long enough to sustain a life-supporting biosphere; however, the findings of our study are from a tiny piece of a very small chunk of the surface of Mars, so it’s difficult to draw any large-scale conclusions about the presence of water on the planet or its implications for life. 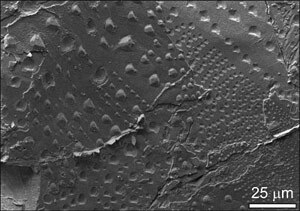 Be the first to comment on "Nakhla Fragment Shows First Evidence of Water Dissolving the Surface of Mars"